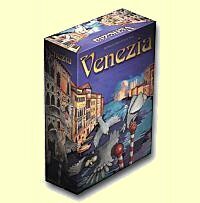 Venezia is a nice offering by Queen games where you vie for control of districts of Venice. In the first stage of the game, you "breed" your pigeons by placing them in a grid which represents the piazza. Then the pigeon feeders and hunters are randomly placed via a spinner in the piazza. A small game resembling checkers is then played, where players try to get their pigeons as close to the feeders as possible. Pigeons landing next to feeders "reproduce" while those landing next to hunters are killed. The pigeons gained from "reproducing" are then secretly deployed to the districts of Venice. Points are awarded to the the player with the largest presence in each district. The game is fairly confusing at first, but once you get the system down it is really quite simple. A nifty little game!